Buff is the pale orange-brown colour of the undyed leather of several animals. As an RYB quaternary colour, it is the colour produced by an equal mix of the tertiary colours citron and russet. The first recorded use of the word buff to describe a colour was in The London Gazette of 1686, describing a uniform to be "...a Red Coat with a Buff-colour'd lining". It referred to the colour of undyed buffalo leather, such as soldiers wore as some protection: an eyewitness to the death in the Battle of Edgehill (1642) of Sir Edmund Verney noted "he would neither put on arms [armour] or buff coat the day of the battle". 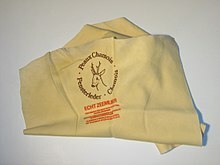 Such buff leather was suitable for buffing or serving as a buffer between polished objects. It is not clear which bovine "buffalo" referred to, but it may not have been any of the animals called "buffalo" today. The word buff meaning "enthusiast" or "expert" (US English) derives from the colour "buff", specifically from the buff-coloured uniform facings of 19th-century New York City volunteer firemen, who inspired partisan followers among particularly keen fire watchers. "In the buff", today meaning naked, originally applied to English soldiers wearing the buff leather tunic that was their uniform until the 17th century. The "naked" signification is due to the perception that (English) skin is buff-coloured. Sand, rock, and loess tend to be buff in many areas. Because buff is effective in camouflage, it is often naturally selected. The buff wingtips of this moth aid in camouflage. Many species are named for their buff markings, including the buff arches moth, the buff-bellied climbing mouse, and at least sixty birds, including the buff-fronted quail-dove, the buff-vented bulbul, and the buff-spotted flufftail. In areas where buff raw materials are available, buff walls and buildings may be found. Cotswold stone is an example of such a material. Unless bleached or dyed, paper products, such as Manila paper, tend to be buff. Buff envelopes are used extensively in commercial mailings. Buff paper is sometimes favoured by artists seeking a neutral background colour for drawings, especially those featuring the colour white. Buff domesticated animals and plants have been created, including dogs, cats, and poultry. The word buff is used in written standards of several breeds, and some, such as the Buff turkey, are specifically named "buff". The rose cultivar 'Buff Beauty'. In 16th- and 17th-century European cultures, buff waistcoats ("vests" in American English), were considered proper casual wear. In the 17th century, the traditional colour of formal dress boot uppers was often described as "buff". Clothing depicted on John Bull, a national personification of Britain in general and England in particular, in political cartoons and similar graphic works, has often been buff coloured. Bull's buff waistcoats, topcoats, trousers and boot uppers were typical of 16th- and 17th-century Englishmen. Buff is a traditional European military uniform colour. Buff has good camouflage qualities as sand, soil, and dry vegetation are buff in many areas. The term buff coat refers to a part of 17th-century European military uniforms. Such coats were intended to protect the wearer, and the strongest and finest leathers tend to be buff, so the term "buff coats" came to refer to all such coats, even if the colour varied. The Royal East Kent Regiment was nicknamed "The Buffs" from the colour of their waistcoats. The phrase "Steady the Buffs! ", popularised by Rudyard Kipling in his 1888 work Soldiers Three, has its origins during 2nd Battalion's garrison duties in Malta. Adjutant Cotter, not wanting to be shown up in front of his former regiment, the 21st Royal (North British) Fusiliers, spurred his men on with the words: "Steady, the Buffs! The Fusiliers are watching you." Soldier of The Buffs (Royal East Kent Regiment) wearing "a new Red Coat lin'd with a Buff colour'd lining, .... Breeches of the same colour as the Coat lining." The uniform of the American Continental Army was buff and blue. Buff is the traditional colour of the U.S. Army Quartermaster Corps. The U.S. Army Institute of Heraldry specifies a "buff" tincture for certain coats of arms, often treating it as a metal for purposes of the rule of tincture. Continental Army uniforms: "The Buff and Blue"
US chevron - quartermaster sergeant insignia (1902-1909) buff on black with blue detail. USAIH illustration which specifies "...a buff colored vertical rectangular embroidered item..."
The colours of George Washington University and Hamilton College are buff and blue, modelled on the military uniform of General George Washington and the Continental Army. Both General Washington and Alexander Hamilton, as chief of staff, had a role in the design of the uniforms. Other school colours described as "buff and blue" include Gallaudet University in Washington, D.C., and Punahou School in Honolulu, Hawaii. Buff is one of three colours of the Alpha Gamma Delta fraternity, and one of two colours of the Delta Chi fraternity. The flags of Delaware and New Jersey, and the former flags of New York and Maine, officially feature buff. The flag of Delaware includes "a background of colonial blue surrounding a diamond of buff"
The flag of New Jersey has "the State seal ... in Jersey blue on a buff background"
The colours of the Whigs, an 18th-century British political party as well as an American one, were buff and blue. The funnels of the RMS Titanic and all other ships of the White Star Line were designated to be "buff with a black top" in order to indicate their ownership. There is some uncertainty among experts, however, as to the exact shade of what is now called "White Star buff". There is no surviving paint or formula, and although there are many painted postcards and at least seven colour photographs of White Star liners, the shades of the funnels in these varies due to many factors including the conditions under which they were originally made and the ageing of the pigments in which they were printed. Speaking mostly to scale modellers, the Titanic Research and Modeling Association currently recommend a colour "in the range of the Marschall color", meaning the colour in illustrations in a particular book. As a relatively inexpensive and readily-available paint colour, and one which went well alongside the near-universal black hull and white superstructure used on steamships at the time, White Star was far from the only shipping line to use a shade of buff as a funnel colour. The Orient Line and Norddeutscher Lloyd used an entirely buff funnel without the black top, while Canadian Pacific and the Swedish American Line employed a buff funnel with a representation of the company's house flag on them. The Bibby Line and the Fyffes Line are two of several firms to use the same "buff with a black top" scheme as White Star, but with a similar lack of certainty as to the exact shade used and how this differed from the famous White Star scheme. Ships of the White Star Line, such as the RMS Oceanic pictured here, and the Titanic, had buff funnels with black tops. Look up buff in Wiktionary, the free dictionary. Wikimedia Commons has media related to Buff (colour). ^ RGB approximations of RYB tertiary colours, using cubic interpolation. "Archived copy". Archived from the original on 2013-06-28. Retrieved 2012-12-29. CS1 maint: Archived copy as title (link) The colours displayed here are substantially paler than the true colours a mixture of paints would produce. ^ "buff, adj.1". Oxford English Dictionary. OUP. Retrieved 21 April 2011. ^ Miriam Slater, Family Life in the Seventeenth Century: the Verneys of Claydon House 1984:11. ^ Carlton, Charles (1 November 2002). "Going to the Wars: The Experience of the British Civil Wars 1638-1651". Routledge – via Google Books. ^ Barnhart, Robert K. (1995). The Barnhart Concise Dictionary of Etymology: The Origins of American English Words. New York: Harper Collins. p. 90. ISBN 0-06-270084-7. ^ Robert W. Masters "What is a Fire Buff? ", Pictorial History of Firefighting, revised edition, 1967; Steve Hanson, "Fire buffs: who are they?". ^ reserved, Phrase Finder is copyright Gary Martin, 1996-2016. All rights. "In the buff - meaning and origin". ^ Taylor, Miles (2006) . "Bull, John (supp. fl. 1712–)". Oxford Dictionary of National Biography (online ed.). Oxford University Press. doi:10.1093/ref:odnb/68195. ^ "John Bull Running". Sterling Times. Retrieved 7 August 2012. ^ a b "AngloMania: Tradition and Transgression in British Fashion," Metropolitan Museum of Art (2006), exhibition brochure, p. 2. ^ Matthews, Stella (February 2000). "The Search for John Bull". "Best of British" Magazine. Archived from the original on 28 June 2012. Retrieved 7 September 2012. while the figure with which we're most familiar, the portly one resplendent in top hat, top boots, buff-coloured trousers, swallow-tailed coat, and sporting the British flag on his waistcoat, was the work of Sir Carruthers Gould as depicted in the Westminster Gazette in the late 1800s and early 1900s. ^ "John Bull and His Bulldog". Gold Posters. Archived from the original on 25 January 2013. Retrieved 7 August 2012. ^ "Buffs (Royal East Kent Regiment) - Famous Units - Research - National Army Museum, London". ^ The TRMA recommend the colour on found on "pp. 54, 60-61, and 67 of the new book Art of Titanic", presumably Ken Marschall's Art of Titanic 978-0786864553. ^ Braunschweiger, TRMA, Art. "White Star Buff: Weighing the Evidence". Titanic Research and Modeling Association (TRMA). Archived from the original on 2011-10-12. Retrieved 28 July 2012. An earlier version of this article appeared on the TRMA website in October 2004 under the title "Photographic and Illustrative Evidence of White Star Buff." In December 2004, the article was rewritten under its present title to reflect new evidence and new debate on the subject since the writing of the original article.